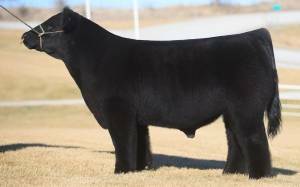 When Tracy Goretska gave us first pick of his 805 donor 3 years ago we knew without a doubt we got the best bull, "Here I Am". He called this spring and said he raised the nest best 805 son without a doubt. Fu 805 is huge boned, long haired, super square hipped and ultra good looking. Use this sire to produce Power and Look!